Dropbox's Mailbox app arriving on Android and desktop and Carousel weren't the only big updates from the company file sharing company today as it also announced Dropbox for Business - for everyone - and something called Project Harmony. 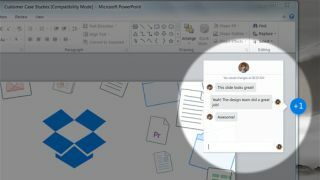 Dropbox for Business provides users with two different online storage compartments: one for personal use, and one for professional. For the first time, Dropbox for Business is available to all users beginning today. "We did this to give admins more visibility and control over their company's data," Ilya Fushman, Dropbox Head of Product, Business and Mobile, wrote in an official blog post. A number of Dropbox features enhance the Dropbox for Business experience, Fushman noted: "Remote wipe helps protect confidential information, account transfer helps you maintain business continuity, and sharing audit logs let you track how your Dropbox for Business information is being accessed." But it's not all about corporate security and "business continuity" at Dropbox today, as the company also announced Project Harmony. It may sound like an ill-fated hippie commune, but it's actually a set of collaboration tools that will let users interact with one another in Microsoft Word, Powerpoint and Excel as if they're using Google Docs. Thanks to Project Harmony, documents will sync to the Dropbox cloud, where those with access can edit, chat and collaborate. Basically it brings Microsoft Office to the cloud, though Dropbox has plans to add other applications later, CNET reported. Unfortunately, there's no word on availability for Project Harmony.